SHOULD YOU GROW OR SAVE FOR A RAINY DAY? answering our question of the issue! uncertainty for a while longer. can do is focus on our business plans and keep moving forward. 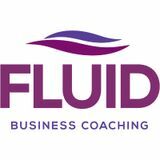 The Fluid Business Book Club Looking for some literary inspiration? could impact all our businesses in the future. copy that sells without being 'salesy'. changes covered in the book? to read with a powerful message. selling 5 Dysfunctions of a Team. Coaches Q&A What's one thing that prevents a business from growing? Ray Moore - Founder & Managing Coach The owner! Many business owners keep asking themselves the same questions over and over again. In order to grow you must be prepared to ask yourself (and your team) different questions. After all; If you always do what you've always done, you'll always get what you've always got. Andy Sleet - Business Coach The owner! I often see owners who are too busy doing the 'day to day' work of delivering their product or service rather than spending time focussing on building their business. A crucial element of Leadership is communication. have faith in our Leader, to feel that they are in control and have a plan. what effect this has on our team. turn up each day, do their job and help the business make money, but what's in it for them? job in hand. This then in turn could equate to employees not performing at their best resulting in a poorer business performance. Imagine that you have a plot of land and you are going to build your dream house on it. It's 8.00am one bright morning and you assemble all the key trades on site; Electricians, Plumbers, Bricklayers, Ground Workers, Carpenters, Plasterers, Roofers etc. purpose for us all to get behind. their skills to help construct this fabulous building, the only issue is there are no plans, in fact the only plan that exists is the one in your head. other as to the best way to proceed. the next instruction as they do not know what needs to be done next! role in that plan is we tend to find that they will often make it up on their own. trust will be lost forever. ball all around the pitch. What happens if I don't have a plan? My suggestion to you is to make sure you get a plan. If you're struggling to know what to do, get some help from either your senior team or from outside. Remember, no plan = under fives football. We must make time for this activity as a priority in a business. What happens if the outlook is bad? Once again, my opinion is that honesty is the best policy. If the outlook is not that good, be honest and tell the team. Sit them down and ask for their ideas on what everyone can do to turn the situation around. Remember that they want a win-win outcome too and you'll be surprised at what they may come up with to help their own security. I'd be really pleased to hear from any readers as to their experience in these matters. What have been the 'goods' and the 'bads' with respect to team communications? 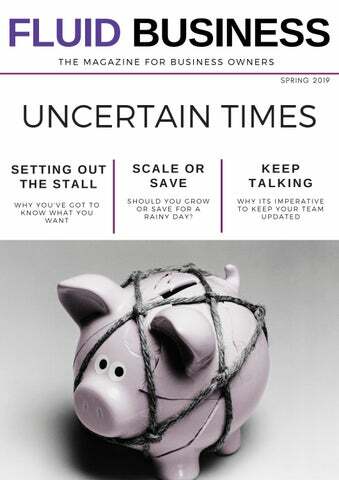 If you have any comments please send them to hello@fluidbusiness.co.uk and we may well publish your feedback in the next issue of this magazine. There has been a lot of upheaval in recent months with many changes to our political and industrial landscape. up or should they prepare for another recession? perhaps we've got more good years behind us that we have in front. a scale down strategy in place. keep scaling up, you've got to continue. the worst we've seen in nearly a hundred years. get yourself ready for when winter does come. reserves you have are eaten up in a panic bid. scale down plans and you’d like some help get in touch and let us see how we can help you. to be ready for what the future throws at us. protecting their future against tough times and providing options during a period when many firms have few or none. On the flip side there are many industry sectors where it is vital to have a scale down strategy. One of the biggest that comes to mind is the construction industry. And therefore, failing to learn is learning to fail. Ray Moore looks at the considerations you should make in order to get the most from the sale of your business Take a moment to consider this question. Most SME business owners never consider this question. when it's time to exit. prepare for sale. Don’t forget or underestimate the resources needed to complete due diligence and the sale process. 1) Over-dependence on one factor. can have a significant impact on the future of the business if the deal falls through. The following is a brief checklist of key areas to be reviewed regularly, not as a one-off exercise. Please don’t delay in working towards finishing your business and getting it ready for sale. The great news is that a regular review is good housekeeping that will pay you back time and time again in profits and cash flow as well as that top dollar valuation. Always be ready to sell your business It just makes sense! Here is a brief list of often neglected areas that will get you on the way to finishing your business. process. Review the cohesiveness of the team. Is it an All-Star Team or a Team of All-Stars (our blog post helps with this!). Review systems and processes to ensure they are up to date and followed. Ensure good financial reporting with rising profitability trend and tight cash control. Regular asset audit and verification. take some hard work from you, the owner. contradiction. It’s a bit of a self-fulfilling prophecy. happen or make any kind of impact on the health of your business. business owner and those of the whole company. or after) is the absolute key to balanced growth. your business and enjoy your current lifestyle. the first plateau – Level 1. Practical steps for setting out your stall to get to Level 3. The business owner has now replaced or improved on the income they formerly had in employment and, on average, they are employing their own small team of up to about ten people. In a perfect world, now is the time for the owner to ready the business for the next period of growth... to set out the stall for Level 2. The reality is that, once again, the process here is far more intuitive and reactive than planned and proactive. Even if you’re not yet at Level 2 but are ultimately aiming for L.3 I still want you to do this! Review your End in Mind Be very clear and honest with yourself about what you want to achieve and why you want to achieve it. The ‘why’ is just as important as the ‘how’ you are going to achieve your goal so please take the time to understand it. holiday and when they return the business is still there. easy to get to a Level 2 enterprise. The secret is stamina, hard work and determination. future market you are aiming to supply expect as a minimum? Again, what are the facts rather than the opinions? What drives your customers to buy a product or service from your business as opposed to any one of your competitors? How far ahead are you actually preparing for... a month, six months, a year? particular area of your business than you do? are at the mercy of factors outside of your control. is going on? Who is the best person to do this? In an ideal world, it's you the business owner. Easily said but often not so easily done! and eventually stumble across the cause of the hold up. So how often do you take a view of your business challenges from 1,000 feet? slowly as the traffic is still heavy. has let you down, yet again! lights and will be there for some time to come. Find out what is going on. Here are three possible options. This is when you jump into your helicopter and go to 1,000 feet so that you can look down on the problem. Now you can see that, yes, the road you are travelling along is blocked at the cross roads ahead but the heavy traffic is caused by broken down lorries on both feeder roads to the junction. Clear the lorries and you will be soon on your way. So what is the moral of my little story? Well, most owners don’t want to just sit in the car and do nothing, it’s so frustrating. The temptation is to get out there and get busy so that you're doing something - anything! It’s tempting to react to, say, a sales dip by getting everyone running around like headless chickens. They may look busy but are they being productive? In the end it may have the same impact as just waiting in the car for the traffic to clear. By taking time to look down on the business you allow yourself the time and view to set the right priorities and align your resources to properly clear your route getting you to your destination quicker, fitter and less stressed. Is it time to take that helicopter ride & view your business from a different perspective?